Not many people know that bamboos are actually a grass – or more like giant grass! Well, Asper Bamboos are known as the giant bamboo species and just like other species, they are known for the rapid growth and perennial woody stems. Its culms are hollow with distinct internodes and nodes, branches and rhizomes. These plants have started stirring worldwide attention in terms of commercial bamboo farming because of their multifarious uses and versatility. Their uses range from commercial foods from the young shoots to subsistence and building materials. It has the ability to offer ecological and economic benefits for everyone in the world and ironically, this plant can be found anywhere because of its ability to grow rapidly. To understand just how rapidly it grows, you should know that in 60 to 90 days, the culm of an Asper Giant can reach its full potential! While we’ve established that they are easy to grow, you should also know that there are a lot of environmental benefits of growing Asper bamboo. This is so because they can cleanse the air we breathe more efficiently than other plants and even protect the environment. Bamboos are known to release 35% more oxygen than other plants because they sequester an estimated 12 tons per hectare of carbon dioxide from the air. This means that in the long run, it has the ability to protect the world from ultraviolet rays by reducing greenhouse gases. Other than this, Asper bamboos are also great for soil conservation. With commercial bamboo farming, people have found that this plant’s widespread root system can effectively control erosion in the vicinity. Furthermore, it can even serve as great windbreaks alongside sustaining riverbanks. Asper bamboos, like the other species of bamboo, are highly renewable materials. There is no need to replant them once their clump has been established. This clump will be able to produce new shoots every year and will be able to stand fully tall at 30 meters! Bamboos are even great substitutes for wood. As the culm matures in just 3 years and builds enough strength, their properties will be quite comparable to species of wood. This is why their utility has been seen expanding to include transformations into several engineered bamboo products like structural panels and doors. They are even a great source of food because it has become a vital vegetable in the daily meals of many people in Asia. It is also considered to be an ingredient that can be used as gourmet in some Western countries where they arrive mostly as imports. Other than this, Asper bamboos are also one of the exquisite components that are being used for landscape designs for an aesthetic and natural beauty. So what should someone consider when planning for commercial bamboo farming? Growing Asper bamboo is actually quite easy, gratifying and fun. For whatever end product you are aiming for, growing them won’t require much of your effort, money and time. Even though large-scale bamboo growing is quite desirable, you can even be successful for your purpose if you start with a small scale. Asper bamboos simply require sufficient sources of water and possibly uniform distributions of rainfall. These plants even love the sun because they will grow really well in such areas. Lastly, all soil and terrain types are perfect for bamboo growth with the only exceptions of waterlogged sites or ones that are continuously swampy. Now that we know that commercial bamboo farming is relatively easy, we can look into its potential uses. Asper bamboos are multipurpose plants which have great economic and environmental values. These many uses of the plant have spread over to many new product and industries over the years. Under the category of domestic use, Asper bamboo culms are manufactured into various garden, fame and home items. These are used in houses creatively with decorative craft purposes with numerous techniques. In some farms, bamboo poles are even used in place of functional fences, trellis or vegetable poles among other garden accessories or accents. In terms of commercial production, these plants are used for arts, foods and even construction. This is because bamboo can become a great substitute for wood products and there are already many technologies that are using bamboo poles for strong construction materials. These include laminated bamboo floor tiles and concrete reinforcements among many others. If you’re confused about its contribution to the food industry, you should know that the tender and young shoots of Asper bamboo are very nutritious and edible. In many parts of Asia and some western countries, these bamboo shoots have become a tasty food alternative. With all these uses, commercial bamboo farming is being found by many to be quite inexpensive. For the 1st thee years, bamboos may work as a complementary crop for the other plants that have been employed there. From then onwards, your business will have sustainable and profitable yields without any expenses of replanting. This is where it would have become your economically and environmentally sustainable primary cash crop. OnlyMoso offers both Moso Bamboo and Asper Bamboo – both of which fall in the category of non-invasive Clumping Bamboos. We offer giant bamboos as an excellent resource for eco-sustainability because they keep soil compact and prevent erosion caused by water. This plant does not require any machinery, pesticides or harsh chemicals for maintenance and has the ability to reduce greenhouse gases. We are offering landowners and farmers the opportunity to make their own OnlyMoso Bamboo Farm with 50% financing from our company and 0% interest on plantation costs. There will also be discounts for large farms and mass purchases while the estimated ROI from a fully harvested acre can be 30k per acre per year from Moso Bamboo. Asper Bamboo, on the other hand, has an estimated annual ROI of 40k per acre per year. You can find out more by visiting our website or calling us for more information at (877) 340-6755. “Your Green Mine” is just a call away! Bamboo has been used throughout the years for a multitude of applications. In modern times, however, people don’t understand these historical scopes and uses anymore, because they have been replaced with modern materials. The shoots of Moso bamboos can be used for eating while the older canes can be used for things like housing structures or landscaping. Manufacturers are also now beginning to see the benefits of commercial bamboo farming and are now beginning to use Moso Bamboo in the most intriguing ways. For one, Moso Bamboo is a perfect source for eco-sustainability. This is so because its extensive root system is able to keep the surrounding soil compact while preventing the erosion that is caused because of water. Not only does it do this, but will also improve the water quality! Moso bamboo is also known for its ability to grow naturally and no forms of machinery, chemicals or pesticides will have to be used. With this minimum amount of effort, the returns are endless. Moso bamboo can absorb five times more carbon dioxide than other plants while producing thirty-five percent more oxygen for the atmosphere. This means that it can considerably reduce greenhouse gases – helping the enviroment tremendously. Commercial bamboo farming also does not require for you to extensively plan for the plant. Moso bamboo can be grown on all types of terrains and in turn, they will enhance these lands by protecting them from landslides or any disturbances in the water cycle. Their biomasses are also known to act as a replacement for fossil fuels. This is so because they can be used to yield many variants of energy products like biofuels, syngas, and charcoal. All of these can act as environment-friendly substitutions for fossil fuels. It was found that just one acre of an adult Moso bamboo has the potential to generate up to 14.33 more biomass as opposed to other species of timberland. After the eco-investment industry faced 2 to 3 years of decline, the investments for renewable energies are moving to new heights every day. Right now these investments are estimated to be at $270 billion worldwide which means the idea for an eco-investment is not a bad one. Forests of Moso bamboo have many environmental benefits because of their increased ability to control soil conditions, absorb more carbon dioxide and produce more oxygen and organic matter. Even some agriculture studies found that in Italy, after the first 7 years of planting Moso bamboo, 52 tons per acre of carbon dioxide had been consumed. Beyond the simple business interests from commercial bamboo farming, it is known by everyone that the planet is in danger. Bamboo plantations can work like an ethical solution for the future of this planet. These solutions consist of building materials, textiles and even precious food other than its natural benefits. Even the continuously falling leaves of Moso bamboo are known to enrich the surrounding soil but releasing rich composts. Because of this, the ideal conditions for other plants to live are effectively made and landfills can be brought back to their natural and healthy disposition. With just one acre of Moso Bamboo, 74,000 liters of water from the rainy season can be stored within its culms and then slowly released back into the soil for the dry seasons. Moso bamboo is also known to bring benefits for the hardwoods. It takes decades at the very least for hardwood to come back after it has been chopped down. Bamboo, however, acts more like grass and less like a tree. If it is given the right conditions, it could even grow up to 3 ft in just one day (yet is not invasive because it’s considered “clumping bamboo”). Bamboo is also renewable – which is one of the factors that sets it apart mostly from hardwood. 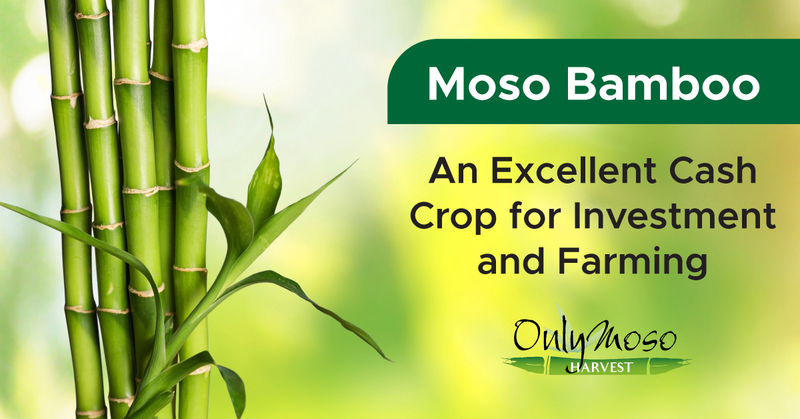 Exactly how grass has the ability to regrow after it has been cut, Moso bamboo can easily be one of the fastest growing species out there. Commercial Bamboo Farmers can also expect Moso Bambooto continue to grow after it’s been harvested – making it a viable cash crop! In recent years, it was noticed that there is a considerable amount of timber shortage in Europe and America – which is also why the market price for these has increased. There are also some protectionist policies protecting tropical forests and some species of trees that are on the verge of extinction. This is another reason why farmers should explore commercial bamboo farming. These areas, once inhabited by fine timber can be prevented from extinction with the help of bamboo farming. This means commercial bamboo farming can bring about a more sustainable economy – both in terms of environment and social levels. 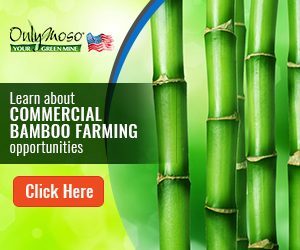 We are offering landowners and farmers the opportunity to make their own OnlyMoso Bamboo Farm with 50% financing from our company and 0% interest on plantation costs. There will also be discounts for large farms and mass purchases while the estimated ROI from a fully harvested acre can be 30k per acre per year from Moso Bamboo. Asper Bamboo, on the other hand, has an estimated annual ROI of 40k per acre per year. You can find out more by visiting our website or calling us for more information at (877) 340-6755. “Your Green Mine” is just a call away! Bamboo is a fast-growing type of woody grass which is quite often mistaken as a species of trees. It even produces leaves and grows upwards with hollow shoots. Bamboos are the largest member of the species of grass with over 1,000 different types and are considered to be the fastest growing plants in the world. Most people who partake in commercial bamboo farming or plant them as a hobby, know that it is an exotic and beautiful plant that comes in a variety of colors that can brighten your landscape. 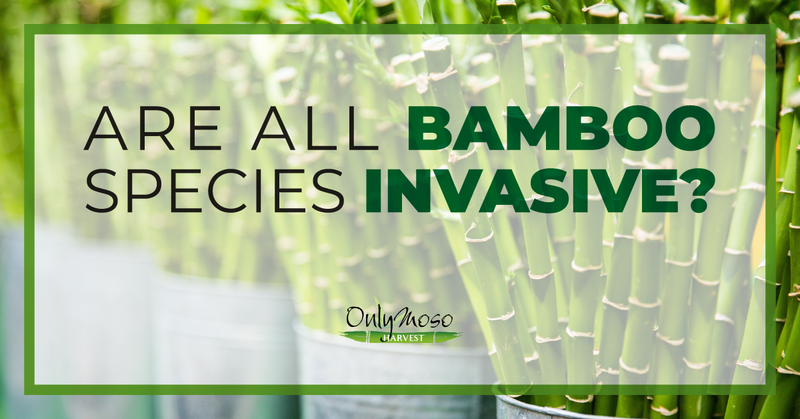 This plant, however, has been known to take over the area where it has been planted – which poses the question, is Bamboo invasive? To answer this question very briefly; not all varieties of this plant are invasive. On the contrary, it is extremely easy to manage. It can even be grown inside a container, which makes it the perfect houseplant. While bamboos are known for their aggressive growth habits, not all of these bamboos are considered to be invasive. 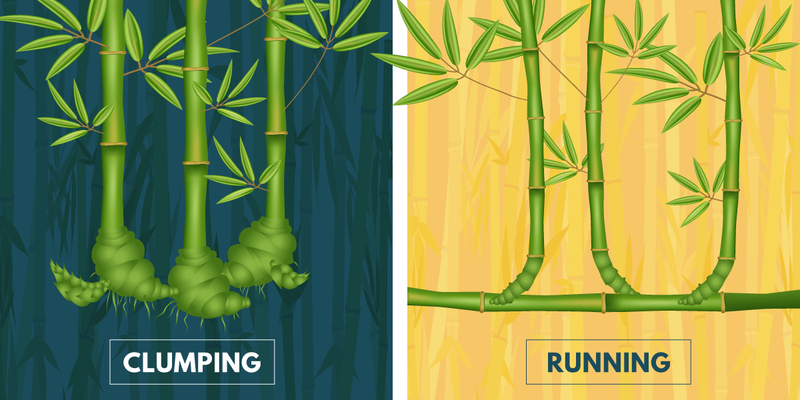 What Is The Difference Between Clumping and Running Bamboo? There are two types of bamboo – “Clumping” and “Running”. Clumping bamboo has a pachymorph rhizome system which signifies that their underground buds turn upwards and take the shape of canes almost immediately. Running types, on the other hand, travel several feet outwards while producing canes depending on the season. Clumping Bamboo is known to gradually expand at a predictable and modest rate, which is why they are considered to be easy to maintain and non-invasive. This in itself answers the question, “Is Bamboo invasive?” These types of Bamboo average at about 10 to 15 ft which increases at a rate of about 1 to 3 ft per year. Running Bamboo, on the other hand, spreads at a moderate to fast pace. They have a leptomorph rhizome system which signifies that their rhizomes don’t usually turn into canes. Instead, they push through the soil and produce new rhizomes that are perpendicular to the parent stem. This is the very reason why they are able to cover so much ground annually as opposed to clumping. Mature Running Bamboo spreads to about 3 to 5 ft on an average basis and the same in accordance to their height. In some extreme cases, Running Bamboo has spread to 15 ft in just one season while some species and genera range to almost 80 ft tall! Bamboo is known to come in a large variety of colors. This includes variety with stalks of varying colors like red, yellow and even dark green. If you add a little of these stalks here and there, your landscape could easily experience an explosion of color and become a center of attention. Some varieties even have a growth rate of approximately 10 ft per year so they can be setup up to work as a privacy fence in no time. If bamboo is planted in rows, they can even form into attractive hedges which can be easily maintained to stay a certain height. You don’t even have to worry about hurting your hedges by pruning them as they can quickly regenerate. What’s more? When these bamboos are planted in groups, they can work towards preventing soil erosion on hills and slopes. Even the regenerative properties of the plant make it a very eco-friendly resource for homes, furniture, food, and paper. While these were benefits of commercial bamboo farming, they can even be used as a great decorative fixture in your home. If you’re planning on having one in your home, you don’t even need to worry about having limited space. If you simply place these in a container like a pot, they won’t spread and will even look excellent as indoor décor or on your home’s patios or porches. They will not only flourish in every low-light environment but are also known to bring its owner fresh air, luck and peace! What About Caring For Bamboo? Bamboo is often referred to as the go-to plant that is fuss-free and low maintenance. This makes them the perfect plant for beginners or those people who plan to plant them indoors. It doesn’t even matter whether the plant receives partial or full sunlight as it can grow in a variety of lighting conditions – although it will grow to its full potential in the full sun. The only thing Bamboo owners will have to be careful about is that the plant may need a little protection in the harsh summer heat. Bamboo plants have the ability to adapt to natural soil even when it is heavy in clay or very sandy; just as long as it can drain well. All potential owners will have to be careful about watering them. They will have to ensure that the bamboo gets about an inch of water per week. You can even add a three-layer inch of mulch around the plant so that the soil retains nutrients and moisture. 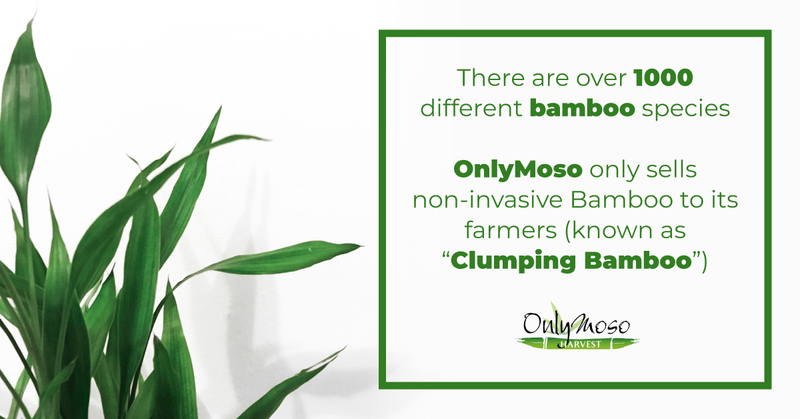 OnlyMoso offers both Moso Bamboo and Asper Bamboo – both of which fall in the category of non-invasive Clumping Bamboos. We offer giant bamboos as an excellent resource for eco-sustainability. They do so by keeping soil compact and preventing erosion caused by water. This plant does not require any machinery, pesticides or harsh chemicals for maintenance and has the ability to reduce greenhouse gases. The OnlyMoso Giant is an example of Bamboos that have the ability to absorb up to five times more carbon dioxide while producing thirty-five percent more oxygen as opposed to other types of trees. We are offering landowners and farmers the opportunity to make their own OnlyMoso Bamboo Farm with 50% financing from our company and 0% interest on plantation costs. There will also be discounts for large farms and mass purchases while the estimated ROI from a fully harvested acre can be 30k per acre per year from Moso Bamboo. 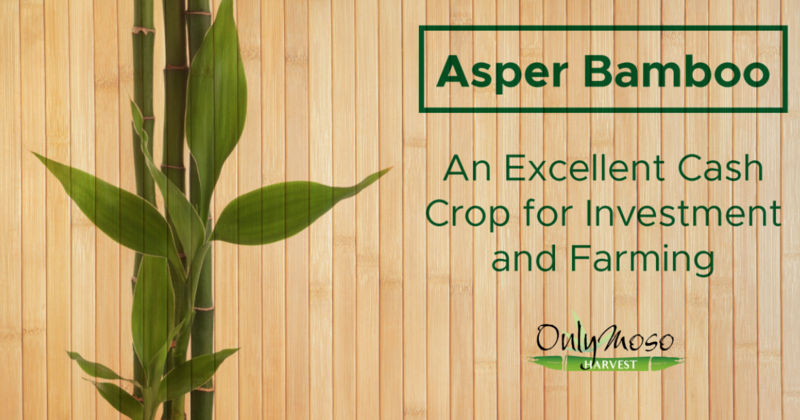 Asper Bamboo, on the other hand, has an estimated annual ROI of 40k per acre per year. You can find out more by visiting our website or calling us for more information at (877) 340-6755. “Your Green Mine” is just a call away! https://www.onlymoso.com/wp-content/uploads/2016/06/logomenu.png 0 0 Roberto Seminara https://www.onlymoso.com/wp-content/uploads/2016/06/logomenu.png Roberto Seminara2018-10-17 16:41:202018-10-29 14:22:35Is Bamboo Invasive? https://www.onlymoso.com/wp-content/uploads/2016/06/logomenu.png 0 0 Roberto Seminara https://www.onlymoso.com/wp-content/uploads/2016/06/logomenu.png Roberto Seminara2018-03-30 13:58:042018-03-30 14:00:22OnlyMoso's Latest Youtube Video "Bamboo - One Amazing Plant"